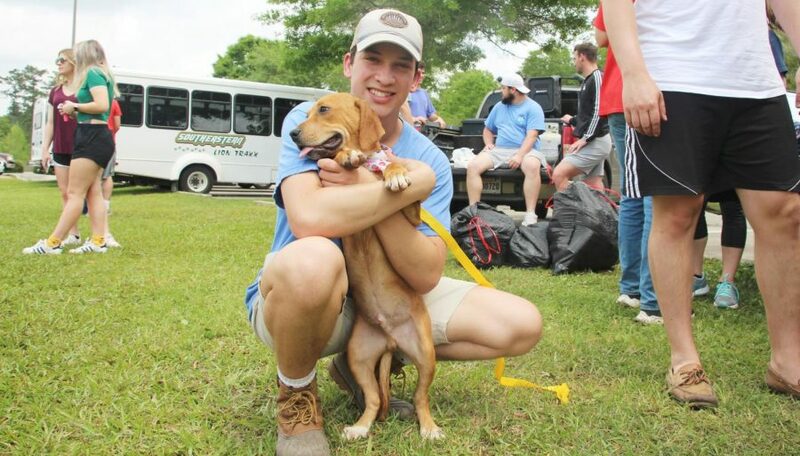 Kappa Sigma's third annual "Puppy Run" raised $2,274 with six out of seven present puppies adopted. At the third annual “Puppy Run,” Kappa Sigma raised $2,274, the most money raised at the event to date. Held at Cook Field from 10:30 a.m. to 1 p.m. on April 6, the fundraiser was accompanied by music and pastalaya. Half of the proceeds raised were donated to the Tangi Humane Society. The other half of the proceeds went to March of Dimes, the philanthropy of the event winner Sigma Sigma Sigma. Along with winning the puppy run, Sigma Sigma Sigma also received the prize of being the best represented sorority at the event. Anthony McMichael, a senior kinesiology major and a member of Kappa Sigma, discussed the growth of the fundraiser. Of the seven dogs from Tangi Humane Society present at the “Puppy Run,” six were adopted. Peyton Licciardi, a sophomore accounting major, did not originally intend to be one of the adopters. “When they opened the back trailer, I saw the dog, and I knew I needed to adopt it,” explained Licciardi. Licciardi named his new pet Scooby. Tyron McLemore, a senior business administration major and a member of Kappa Sigma, thanked Monster Ink, The Brown Door and Cate Street Pub for their contributions.